Rake, IA appears to be 2 hours away from my MapQuest search. That's probably far enough away that Tim will put the kibosh on going to this open house at a church a couple turned into a house. Check out the video footage on-line. But it doesn't look like it does the place justice. Here at home it's been published in the paper that King Corn will tentatively be played at the Community Center on Monday, December 10th at 7:00 pm. I'm hoping that happens. I really wanted to go to Iowa City to see it with my sister, but it's looking like that's not going to work out (sorry Mary, I'm saving my trip bargaining points to come to the Iowa River Power Restaurant with you and Bjorn). So hopefully Kelli over at Sugar Creek Farm will be able to make the short trip down and go with us. I love how in the first picture it looks like Lyle is trying so hard to think of the answer. And it didn't bother me at all in real life but now that I see those folding chairs in the photos they look so tacky. I really need to start going to some sales, those little bent wood chairs shouldn't be that hard to find right? 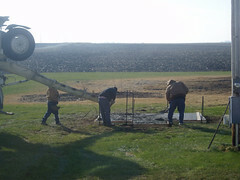 Today Tim took the day off of work to pour the concrete pads for Molly's play house and the corn burning stove. 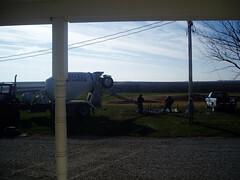 We haven't had the cement truck out here since we poured the footings for the front porch. Tim says he remembers cement being $40 then (~3 years ago), he's interested to see what it's going to be now. Did you know that when you have concrete poured at this time of the year there is a winter charge? I guess that is for heating the water, the different blend of cement, etc. So my advise would be to wait and do it at a more typical temperature/time. But those of you who know Tim know that when he decides he wants something he wants it RIGHT NOW. My step-father came out this morning to help. Tim was really worried. Almost to the point he was going to refuse his help. I wasn't too happy about that. I'm pretty sure Bruce has been working with concrete since he was in diapers. Generations of his family have run the cement plant here in Greene. Why would you refuse free help from an expert. Well, Tim was worried his forms were not up to snuff and, even though he didn't admit it, I think he was worried Bruce would try to discourage him from pouring it today. But I talked him into letting Bruce give him a hand and I know he's pretty happy I did. The concrete was firm enough to gently walk on late this afternoon and it's now covered in a nice blanket of straw and tarps for the night. If you read this Bruce thank you again! This is the pad for Molly's play house. It will face the kitchen door/window so I can keep an eye on the girls while they play in it. The little out butting in the front is a step. Tim nicely rounded out all of the corners so nothing was sharper than it needed to be. I forgot to take the camera when I went out to look at the pad for the corn furnace. It will sit behind the house where the burn barrel used to be. We put it there because it was decided since we were going through all the cost of putting this furnace in for the new shed we might as well buy a little bigger one and heat the house with it too. Everyone we've talked to who has one likes their corn burner. We're going to have to take the electric heat insert we got for free off of the top of the furnace to install it, but that thing has proven to be a dud so I'm not to upset. 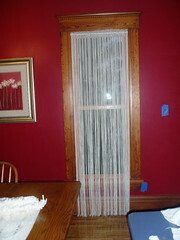 Plus, it was free so we're only out the labor and installation supplies for installing it. I'm sorry I don't have any pictures. I thought of the camera right when I got everyone seated, but something came up and I forgot completely about it. Maybe Jen has a few and will post them on her site. Tim and I agreed that it went very well. I forgot a place setting. It was stupid really because I remembered to borrow a booster seat for Connor, but then forgot to set a place for him. 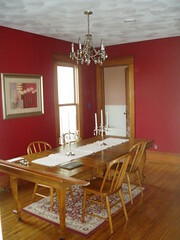 -sigh- If I had it to do over again I think I would have squeezed a folding table onto the end of the dining room table. I know it's less classy, but then we all would have fit into the dining room. I didn't get much of a chance to talk with Kyle and Amy before they left. Molly had been on the road the last few days, staying at Stacyville Friday night and all Saturday and then to my moms on Sunday before the party. I was worried she'd be a real crab, but she did very well. She really didn't like sharing her toys which I'm horribly embarrassed about. I know I shouldn't expect it, but I want her to look sweetly at our company and offer up even her most favorite of toys. Instead, she'd stock piled her treasures on Grandpa Lyle's lap expecting him to guard them for her. And no mom, you don't have to say it, I know she's just like her mother. I know it's not quite Thanksgiving yet, but last night I couldn't help thinking how much I have to be thankful for. A good husband, a beautiful home, healthy children, and wonderful friends and family (mom, thanks for watching Molly so I could get the cleaning done). And Kelli, we missed you and the family. One of these times we're bound to get everyone together, right? The party is tomorrow and we have a ton of stuff to do. But just a few quick pictures of the progress. What ever happened to that school of thought? I went "shopping" today. It was a very painful experience. First I had to return a sleeper I got as a gift that Elsa was too big for. Well the person who bought it for me took off the tags, but I did have a gift receipt. It took me 20 minutes at the counter to get my money and by the way the lady treated me you'd think I'd had asked her to build Rome in a day. My 1 1/2 year old complains less in a month than what that lady did in that 20 minute interval. But I consider myself lucky because I did get money back and sometimes when I go back with something I'm not so lucky. Later on today I headed out for groceries for the party on Sunday. I'm doing a ham. I decided this because my mother has done a ham for a couple of occasions now and it's very easy to do and very tasty. Well I went to the store (large chain store that now sells groceries, not the local guys) she told me she buys it from. And low and behold right when I walk in there is the ham. But it looks a little too big so I head back to the meat department but I'm not finding the ham. I'm in a hurry because Molly is crabby so I decided that I'm not going to mess around I'll just send left overs home with the guests. So I get to the check out and they can't find a price. It turns out this particular ham is part of a dinner pack. You need to buy a bunch of other crap just to get the ham. At the time the cashier is telling me this Tim is already very unhappy and embarrassed (he doesn't deal with going against the norm at all, he likes life to be like those credit card commericals where everything runs perfectly until the person with the check book shows up), and he can tell I'm going to get belligerent. I sense this, but I still prod on. I ask if I could possibly buy the exact same type of ham with out the additional stuff. The cashier looks at me like I'm asking her to cut off her arm and sell it to me. At this point Tim cuts in and says I must have the wrong ham (ooooooo, does that make me mad!) and we'll just pick out another kind. We pay for our other purchases and I'm steaming. I lite into him saying I know exactly what kind of ham my mother buys (I do!) and what are we going to do... Tim manages to get me out of the store and into the car promising me he'll go back and pick out a new ham and it will be fine. I call my mother on the way home to whine. She makes me feel better by telling me a couple different ways you can doctor up a plain ham. I start to feel a little better. I'm the customer, I'm always right. And to me the right thing to do is to sell the customer who wants a freaking ham the freaking ham! 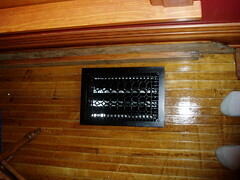 Last week when we were refinishing the floor in the dining room we had to take the grates out. 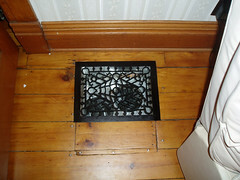 Well one of the grates is right around the corner from the door. The night we did that Molly takes off into the room and rounds the corner and BOOM, she's in the floor. Luckily she was more scared that hurt. She had just gotten a giant knitted winter hat with the braided tassels on the side that are so popular now from Grandma Ronnie and that protected her head from the sharp edge of the floor. She went all the way in, one leg in the tube. After some hugs and kisses she was down on the floor again running at full speed. But we haven't let her back in there since. But now she'll be free to roam once again because Tim got the grates refinished. He's of course on a kick so he took the living room ones with him too. 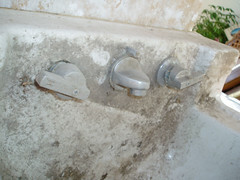 That last post was so boring that I had to add another one today since we got the faucet for the downstairs bathroom. It's a story of how houseblogging saved the day once again. 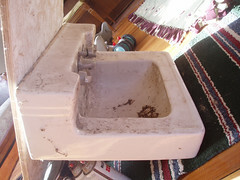 The sink above was in the house when we bought it. Not actually attached to a wall, but just lying on the floor. I really liked it. Tim says because it is square and I have a affinity for all things square. 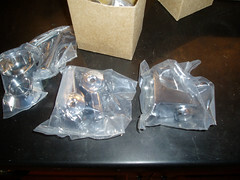 The only problem was Tim wasn't happy with the old faucet and your normal big box store faucet wasn't going to cut it with the openings it had. So one day I was reading a post over at House In Progress about their bathroom. I clicked on their link to Chicago Faucets just for fun and just happened to run across the link to our new faucet. It's apparently called a shelf and angle back lavatory faucet. Who knew? So now the sink is a go. Thank you Aaron and Jeanne! Yesterday evening Tim got the pass-thru doors stripped. He didn't use the typical stripper we use, Dads (we bought it at K-Mart). Instead he used a furniture refinisher. 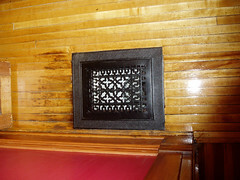 This is what he also used on the foyer stairway. It's much more liquidy than our normal stripper and Tim just sprays it on with a spray bottle. He seems to like working with it better. I can't say myself since I haven't had a chance to use it yet. 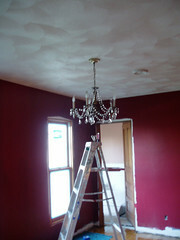 Tim said it was really great on the dental moldings we have downstairs. He also got the doors stained. He said they turned out nice. I can't wait to see them. I've got to get the bottom of the pass-thru cleaned out today so he can beef up the shelves. They really sag under the weight of all my good dishes. 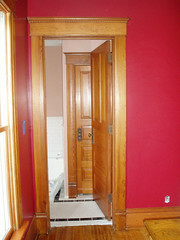 Saturday we got the woodwork up in the dining room and the two bathroom doors operational. The door to the bathroom was on previously, but the knob wasn't in place yet. Of course we weren't able to locate all of the pieces. They are around here somewhere, it's just going to be keeping our eyes open for them. Like ask I was sorting the dining room woodwork I ran across the tiny pieces of door stop that were missing from the living room double doors. Sunday I wiped everything down in the dining room while Tim painted on the kitchen porch. Then later that night he helped me move furniture in. The table and chairs my mom bought maybe 20 years ago at an auction. It was in our kitchen on the farm. The cabinet is that one the neighbor had out in the yard. The picture on the wall Tim's mom bought me quite a few birthdays ago. The rug is way to small for the space, but it will have to do until we can find a rug we like/come up with the cash for it. 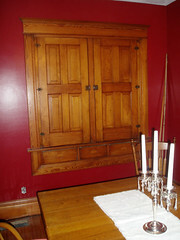 The only woodwork that didn't get put up (besides the few missing pieces) is the trim around the pantry pass-thru. The doors weren't refinished yet so Tim took those down and hopes to work on them the next few evenings so they are done in time for the party on Sunday. At first I was thrilled that Tim was excited to work on the house again, but I guess this is a classic example of be careful what you wish for. He's become almost frantic. He's talking about taking this here or that there to be refinished. I don't know where the money is coming from since he's planning this shed project also (I'm starting to think I should make sure he's not dealing drugs). Last night on the way to my uncle's birthday party we drove by an old house they are fixing up in Clarksville. I made a comment about the scaffolding they had up and Tim replied, "Yeah, I might paint the porch this weekend." I looked at him with disbelief and said, "Wouldn't it be better to get the trim in the dining room since we have a party planned for next Sunday?" "We'll see," he said. Which means I'll do what ever I want no matter how stupid it is, thank you. Then again before bed he drags me out to the foyer and says, "What about blue for the walls? We could have it painted before Thanksgiving." "You mean before next weekend?" I ask. "Yeah," he replies. I tell him no. 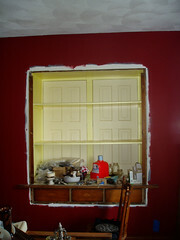 Some how I must stop him before he starts 20 projects and doesn't get the dining room finished for the company. Stay tuned to see if our marriage survives this weekend. Definition: Disease causing swelling to portions of the brain related to memory. Most common symptom is forgetting past aches, renovation disasters, monetary drains, household messes, etc. The effects of this disease include waking up in the morning and saying "I can't wait to work on the house this weekend." As my husband did this morning. Seriously. Sickness it's the only explanation. 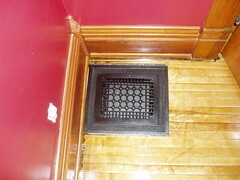 The remedy is a good stout weekend of trim application, furniture moving, grate refinishing, and mess clean-up. The light in the dining room is up. We purchased if off of Ebay just over four years ago. 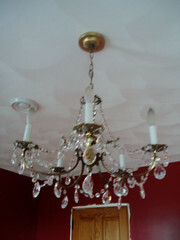 Amazingly this delicate fixture has been moved all over and never broken. Right now it is missing the crystal ball that hangs in the center, but I remember seeing it up in the attic a few months ago so I'm sure it can be relocated with out much trouble. I think it's too high. The only problem is who ever rewired it didn't leave enough wire to hang it very low. In fact, we had to remove links from the chain to hang it. I'm keeping those links and after a few years (when I get bored with having an actual working light fixture) maybe I'll have it re-wired again to hang at a more respectable dining room height. Maybe in say, four years. For now, since it is such a delicate fixture I don't think it looks awful. The final call will be made when the table gets drug in. Here's a shot of the finished dining room floor. Want to know how dusty it gets? Look at that wall on the right. We are guessing this is maple. It's not the original floor in here. You can tell because it was put in around the baseboards and door trim. 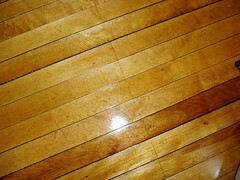 Someone told me that this is a "school house" floor. 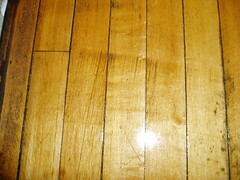 When they shut down the one room school houses people would take the flooring out and install them in their homes. I don't know for sure if this is what happened here or not. 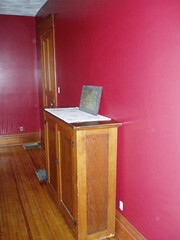 It's a beautiful honey color that goes very well with the red walls. Our only complaint is someone at some point tried to sand it down and didn't do a very good job. You can see the mars made in the wood. They are especially bad by the doorway to the kitchen. I tried to take some pictures below. Tonight I'm hoping Tim will be home in time to install the light fixture and maybe even get the new window trimmed out so we can start to install woodwork. 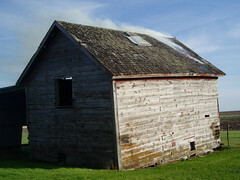 Tim decided he wanted the new shed to go where the grainery is standing so he chose yesterday afternoon to burn it down. Here it is before the fire. We didn't take it down when we tore the rest of the outbuildings out because the little lean-to on the side was a nice place for Tim to store the Oliver we mow with. Well, now the plan is for the Oliver to be kept in the new shed so bye-bye grainery. It's sad to see these old out building go. It really affects the look of the place, but we can't afford to maintain them. 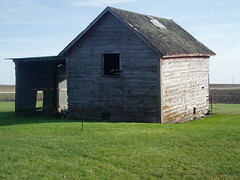 We decided when we bought the place that we'd do everything we could to try and save the barn, but we just wouldn't be able to save it all. It's hard, but you learn as you go through one of these renovations that sometime you have to let things go so save something else. We had spent yesterday morning at my mom's house because Tim had put the second coat of finish on the dining room floor and it was kind of stinky at the house. I really wanted to see the fire, but Molly has been teething and not sleeping well and she had just settled down for a nap and Elsa need to eat soon so I had to pass. Tim wanted to get it started fairly early because we were supposed to go to his folks house for supper. I told Tim to take lots of pictures. I called him about an hour after he left to see how it was going. He said fine, but the camera had run out of space on the card so he only got one picture. I asked why he didn't delete old photos. He said he didn't know how. I sighed and resisted beating myself on the head with the phone out of frustration. I then asked if he was about ready to leave for his folks. He replied that it was burning fast and to give him about a half and hour. I started to say something to the effect of how to delete photos on the camera but he cut me off saying, "****, I've got to go, I really gotta go." And since he tends to be a little over dramatic I hung up the phone and went to get Molly up for a snack. About a half hour later I got the girls packed up. I headed outside to tell my mom and step-dad good bye. They were working on landscaping around the new addition they built last year. Molly was happy to be outside with all the crunchy leaves and I had trouble getting her to leave because she was busy helping Papa "drive" his tractor. I jokingly said we had to go see if the house was still standing because of Tim's parting words. Mom said that they had heard the fire department leave town and we all had a good laugh. I finally got my daughter in the car and headed north towards the house. No big cloud of smoke that direction, things were good. I was on the road just at the base of the hill before you see our house when Bubba, one of the local firemen came over the hill. When he saw it was me he laughed and waved. It was then that I got the sick feeling in my stomach. As I crested the hill I saw the house was still standing but the towns entire fleet of fire engines were headed down the road back towards home. Tim is in the yard by a smoking pile of rubble talking agitatedly on his cell phone. I get out of the car and make him hang up the phone so I can find out what happened. It turns out while he was talking to me the ditch across the road started on fire. After he hung up the phone he headed across the road to put it out with a shovel. 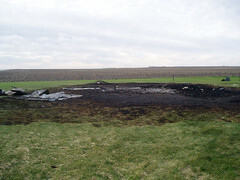 Well, the shovel broke and the fire spread to the corn stalks in the field. He ended up calling 911 (what is strange is this is the second time this month he's had to call, there was a cow in the road that someone hit coming home a few nights before) and they sent out every engine the town of Greene owns. He's like, "Yeah, you missed it Kip and Bubba where here. I didn't ask Kip about the wedding but..." like I had just missed some friends stopping by for a beer. They had put of the fire in the field and then by law put out his building fire. Luckily the building was pretty well gone by that point so he won't have to try to burn it again. Later on that night as we're getting ready for bed he's telling me that the firemen were pretty serious when they showed up. He was standing along the road to talk to them and they just drove right by him and started putting out the fires. I must have looked at him with what could only be called amazement and said, "You thought they'd chat before they went to work?" "Well yeah," he replied. "A quick conversation, maybe say hi." Tim went out this morning to run shed related errands. He called around 11:30 and said, "I've got the sander, clean out the dining room." Surprise! So here he is working away. 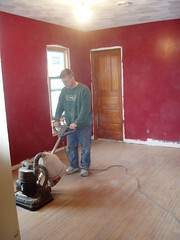 This was the sander we rented to do the up-stairs hallway, we had an orbital for the downstairs floors. We just got done talking about it and we like that this sander is leaving the "character" of the floor. The orbital would have made short work of it and stripped it down to white. This isn't sanding as fast, therefore "character" remains while still evening out the warping in the boards. We're not that worried about the uneveness because someday most of the floor will be covered with an area rug, and even if we weren't doing a rug the giant oak table will really break the space up. 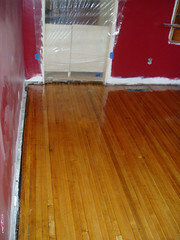 Therefore the sanded area doesn't have to be pristine. Oooo, I had better find some cute crafty Christmas party invites to make! Here's the library. It's the last room to be worked on here at the farmhouse. There for it has become storage. Though you can't tell, a lot of what is being stored here are tools. 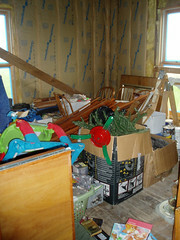 The rest of what we have collected is down in the basement which floods every spring. It's not a good situation. That's why I haven't protested too much when Tim told me he wants to build a shed this fall. I thought we had a kind of un-said agreement that the house would be finished before we started on the exterior structures. But I'm really looking forward to this shed. I can picture tools put nicely away in tool boxes and hanging on peg boards. Tim plans to insulate and run water to the shed so I also picture a nice faucet on the side that I can use to water the garden (this year I would make 5+ trips from the kitchen faucet to the garden). I can use it to clean my fancy paint brush! He's still pricing and looking at options, he started off wanted to turn the barn into one. But after much angst we decided it wouldn't be the best option for the barn. Plus, for what that would cost we could build a standard tin shed and roof the barn too. So that is what we decided to do. The only problem is the guy we want to do the barn roof is busy until next spring so we'll have to cross our fingers and hold our breath that it survives another winter. He's also looked at options like changing the pitch of the shed's roof to give it a more old fashioned look, but people look at him funny and ask why you'd do something stupid like that (i.e. spend more money to not gain any room). On to the barn artist. I think I have been a good girl this year. So Santa, if you read this, I would like to find one done for my barn in my stocking please. Here's the article from Iowa Farmer Today. Since Tim is out helping my dad harvest corn instead of working on the dining room floor I'll take today to tell you about my aunt Carla's new (ok, it was a year old in July so not quite so new) quilt store. She and some other local ladies started a quilt shop in one of the corner buildings of their town, Williamsburg, IA. Check out this link to their website for pictures (if they don't come up try clicking the about us link off to the side). They don't really do the place justice. It really does have that "country store" feel they were looking to achieve. I wish they had a picture where you could see the back wall. On that wall there is a door to a little office they have. Instead of being a solid door they used a wooden screen. It really works well balancing separation of the space with the openness needed to keep an eye on customers who might have needs. It's such a cute idea I wish I had a use for it here at the house! Caught this on the news tonight. I love this building. Click on the picture here for a decent view of it. Believe me it's got a even more style in real life. The unfortunate part is it's in a pretty bad neighborhood. I'd like to go to the informational meeting the mention at the end of the article, but the way things have been going here in Iowa 60 miles is a long way to drive just to get depressed. 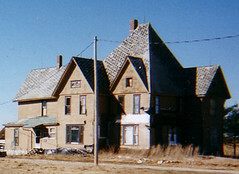 How cool would it be to turn it into one of those assisted living homes (check out the photo album at that place!). Have you seen the new ones they are putting up? For what one of those puppies cost they could do a pretty decent remodel I would think. And no, I don't want to hear you arguments against it and why it wouldn't make sense, so don't post them in the comments. I'm just going to lean back and picture myself living it up there in 50 years. So what if it is in a bad part of town? Mess with me and I'll run you down with my motorized wheel chair and beat you with my cane. Oh yeah.